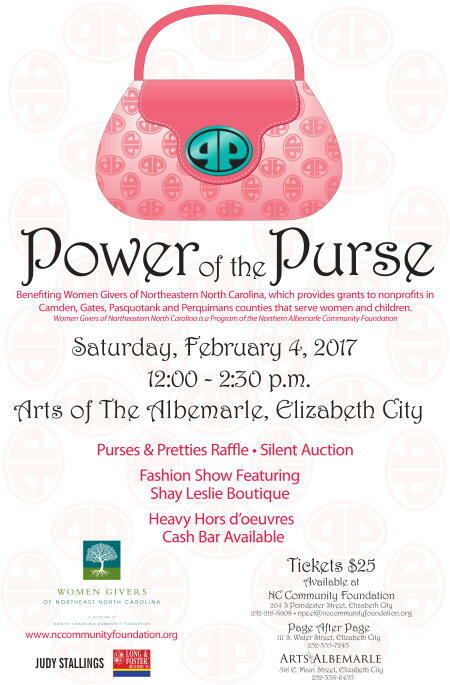 The Women Givers of Northeast North Carolina is hosting the ninth annual Power of the Purse & Pretties raffle and silent auction to support charitable efforts in the counties of Camden, Gates, Pasquotank and Perquimans. The event will take place on Feb. 4 at Arts of the Albemarle at 516 E. Main St. in Elizabeth City from 12:00-2:30 p.m. Those wishing to purchase tickets can click here to contact NCCF Regional Director Natalie Peel. Event tickets are $25 each. Shay Leslie Boutique will offer a fashion show. The event raises funds to support grant awards made for direct services of area nonprofit organizations meeting local needs of women and girls. Area nonprofit organizations can apply online for these grants beginning March 11.